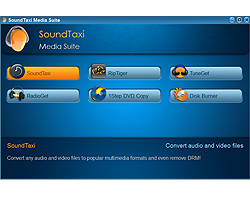 RipTiger is the easiest and the most powerful program to capture web video and TV, convert downloaded files and copy them to your iPod. Start capturing, downloading and converting popular streaming video formats now! Note: RipTiger will only download and convert videos that are accessible free of charge and in no way protected from being publicly viewed. This restriction, inter alia, applies to password and DRM protected videos, of which neither can be downloaded with RipTiger in pursuance of relevant provisions of the copyright law.